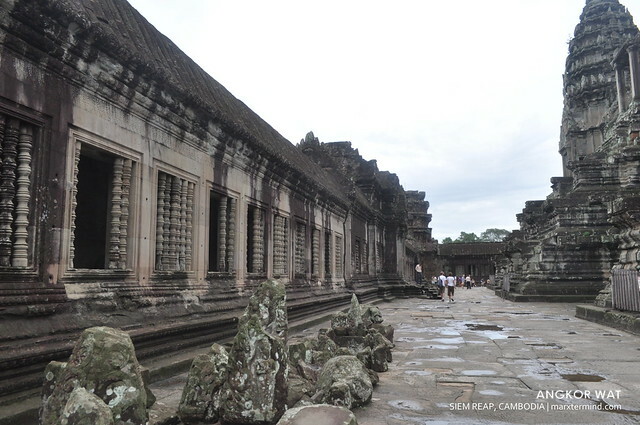 One of the things I was really excited about my Southeast Asia trip was our visit to Angkor Wat. 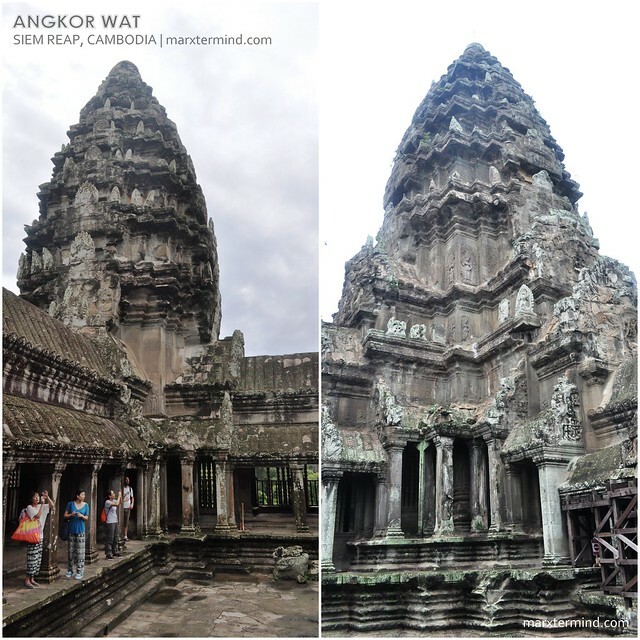 I put excitement on all of the places we had visited during the entire trip but the Angkor Wat just really stood up among the myriad of structures we’ve been to. 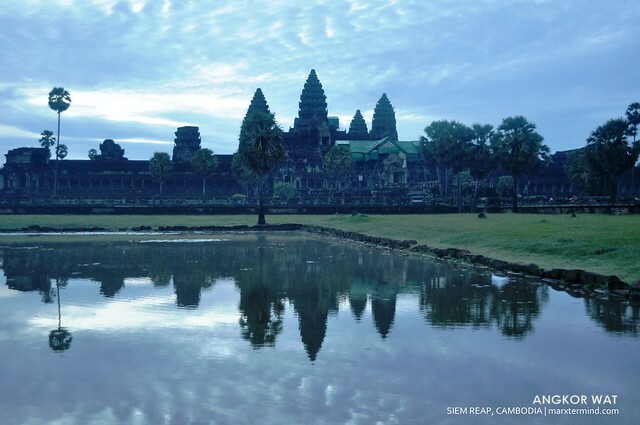 Located 5.5 kilometers north of the modern town of Siem Reap, Angkor Wat is said to be the largest Hindu temple complex in the world. 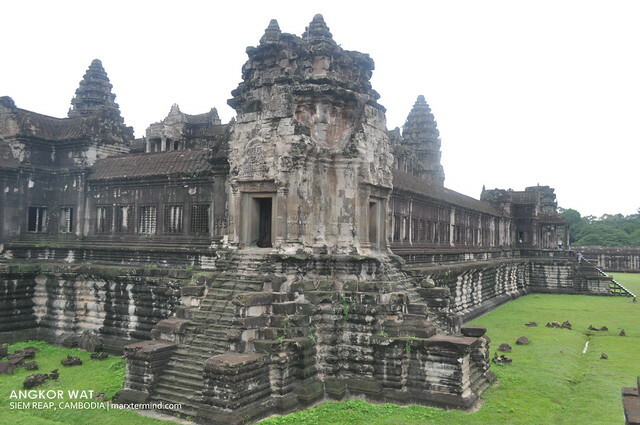 The name Angkor Wat means “Temple City” or “City of Temples” in Khmer. 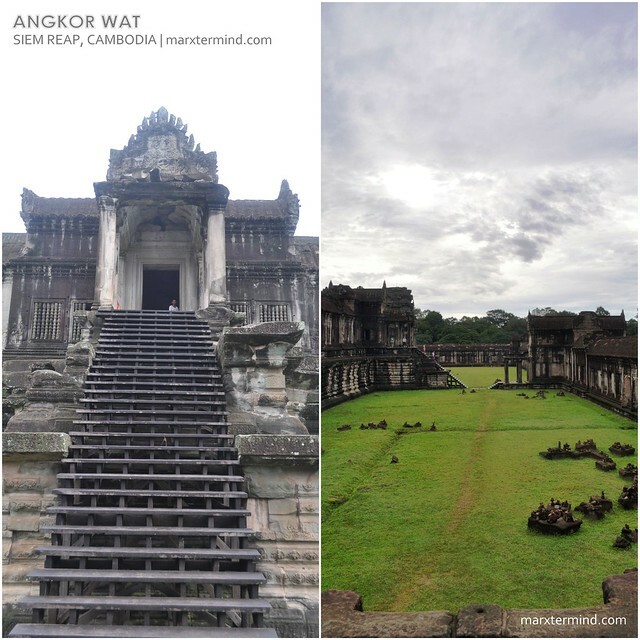 The word Angkor means “city” or “capital city” while the word Wat means “temple grounds”. To know more about its history, you may check it on wikipedia. Roughly 7 hours since we arrived in Siem Reap, we woke up from our bed and prepared for a full day packed of temple visitation. Our call time is at 5:00 AM (ICT). 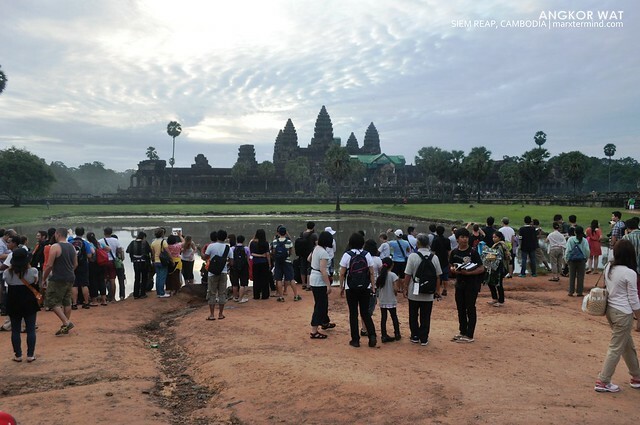 We will be having a sunrise tour at Angkor Wat thus explains why we had an early call time. We left the guesthouse on time. It was a very cold morning. I can feel the cold breeze thumping into my face. It seems it rained last night as the roads were still wet as we traversed our path to the famous temple park. 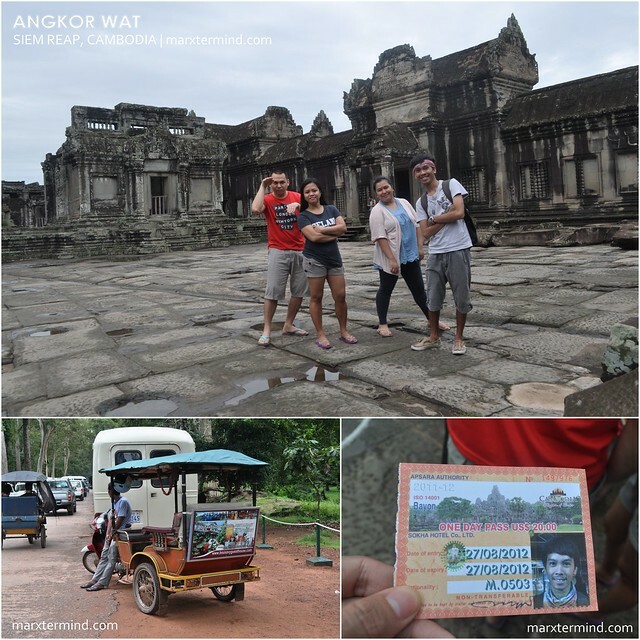 We stopped by the main entrance gate and paid the Angkor Wat Day Pass for US $ 20.00 per person. An ID card with your picture will be given upon payment of the entrance fee. Cost of the temple passes varied depends on the number of the visits you like; like there’s a full day pass, three-day pass and a week. If I could be given a longer time for a visit on this town, then I would probably be availing a three-day pass. It was still dark when we reached our destination. We should have brought our flashlights since there are no lights available on the way to the famous temple. There are stalls selling breakfast (our guesthouse let us bring our free breakfast), as well as people offering their tour. I initially planned to get a tour guide but I had changed my mind as I thought we can tour around the temples by ourselves. A guide usually costs about US $ 30.00 for a day. 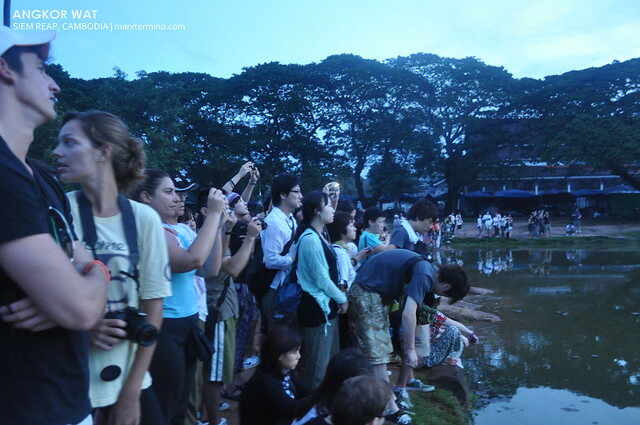 With bounty of people heading to the Angkor Wat temples, we just went to the flow and followed them until we reached the area where the people waits for the sunrise. It is an area near the lagoon wherein you can have a magnificent view of the Angkor peaks; the temple as it shown itself with the sun rising behind it. Minutes have passed but seems like the sun was too shy to show up. Blame it on the rain happened last night! 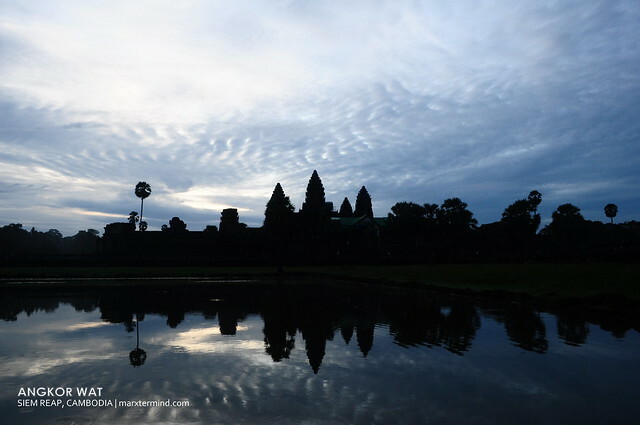 Nevertheless, it still really paid off to catch it that early morning as a majestic view of the Angkor Wat has been beholden right before my eye. 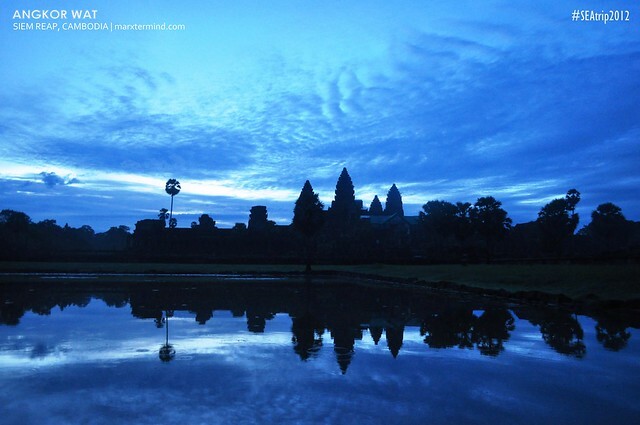 You can also witness a very picturesque Angkor Wat with its reflection at the water. And looks like there’s a restoration on-going. We left our spot; then looked for an area wherein we could have our breakfast. We had our breakfast first before continuing the tour. People still taking a snap of that magnificent view. 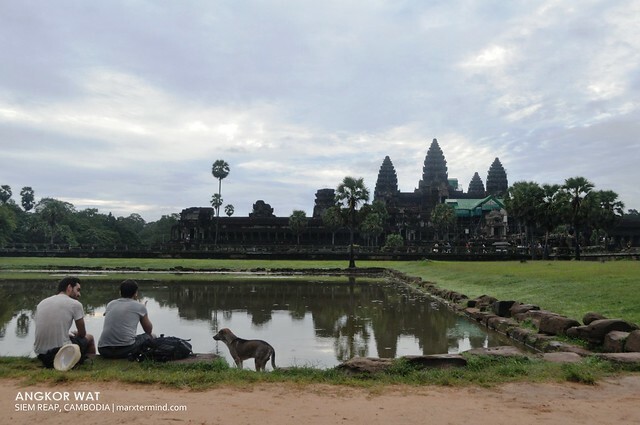 And when people move out of the area, then one or two could have it’s time to take some time and nourish the captivating view of the Angkor Wat. After we took some pictures outside we had finally entered the temple. 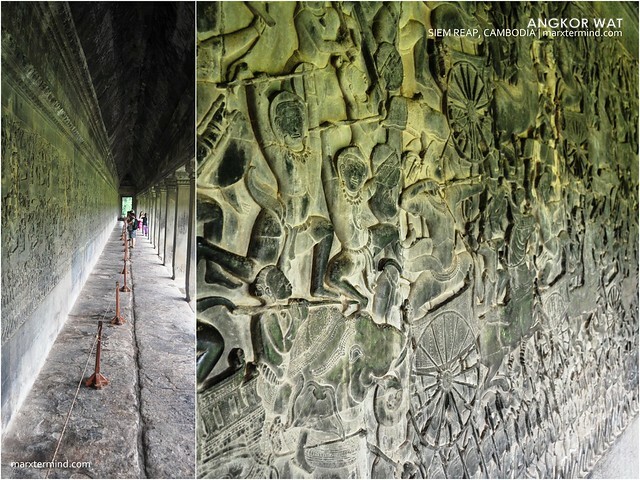 Most of the pathways inside the temple are carved with such designs. Too bad we don’t have a tour guide with us to explain everything. Regrets are always in the end. 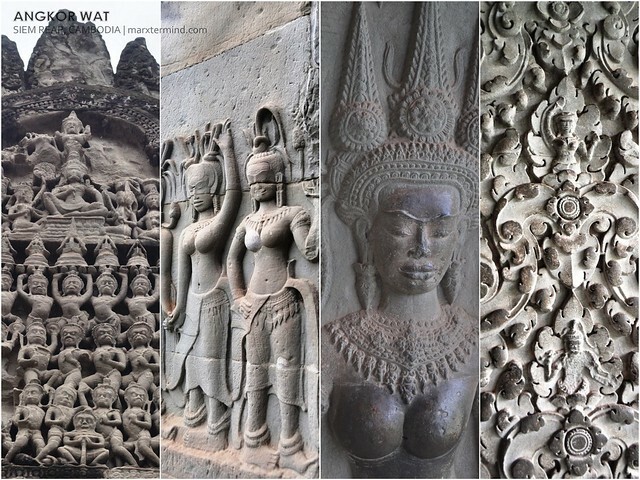 These carvings are also evident in some parts of the temple, too. 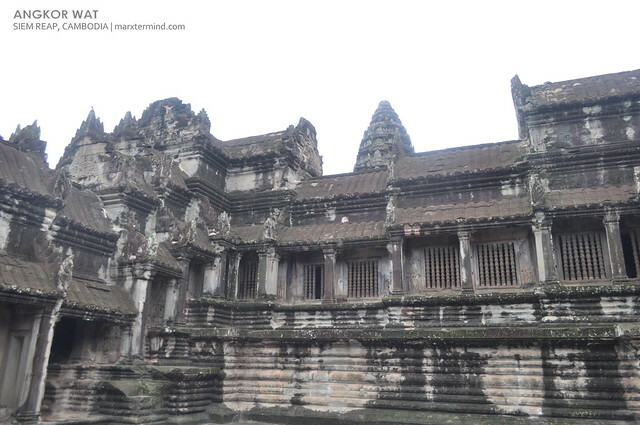 And here’s the most of the architectural design (if that’s how you call it) of the Angkor Wat looks like outside. 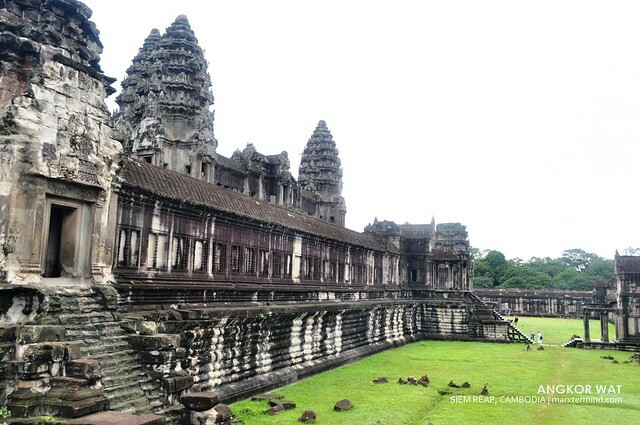 We went inside and I was surprised that there’s still another temple built inside of the Angkor Wat. Does my statement makes sense? There are greenery areas that surround the center temple. 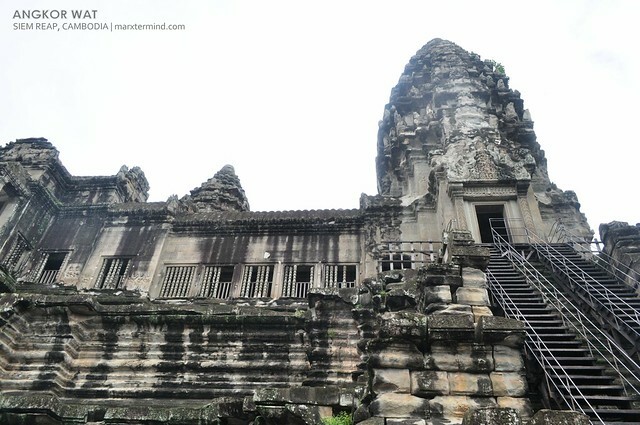 There are also some smaller temples situated in some parts of the grassland which you have to climb up using the stairway. We moved on and went inside the center temple I was talking about. There are parts of the temple that isn’t accessible for tourist. Also, this is a temple and you have to obey with rules. You also have to pay respect in each and every structures found inside it. We had passed by an area wherein you have to climb up to get to that area of the temple but that will still be open by 8:00 AM (ICT). 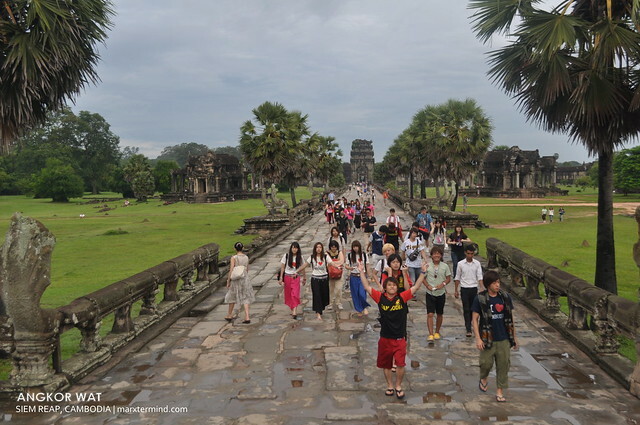 A dress code needs to be observed when visiting that area of Angkor Wat, one must dress appropriately. Despite of the time given to us by our tuktuk drivers that we have to get to back at 8:00 AM, we still waited for that area to open. Time doesn’t matter to me that moment as I have this thinking that we’re already here, why not make the most of out it. This has been the highest point of the temple that we’ve been to. We were able to have a view of the entire temple ground by looking from each side of the temple area. When everything seems to be similar to me already (nagsawa), we went down and decided to go back to our tuktuk drivers. 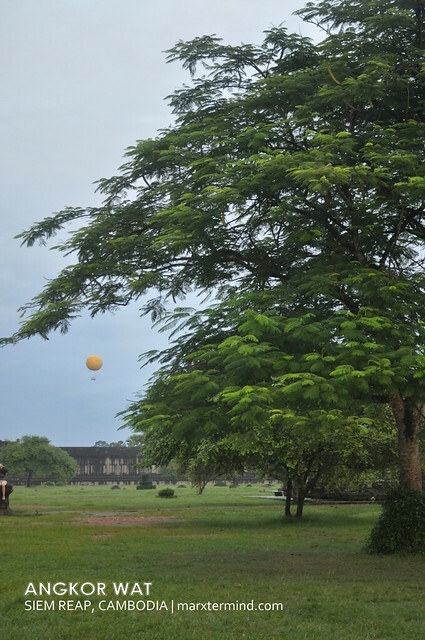 The temple park can also be seen by having a hot air balloon ride. 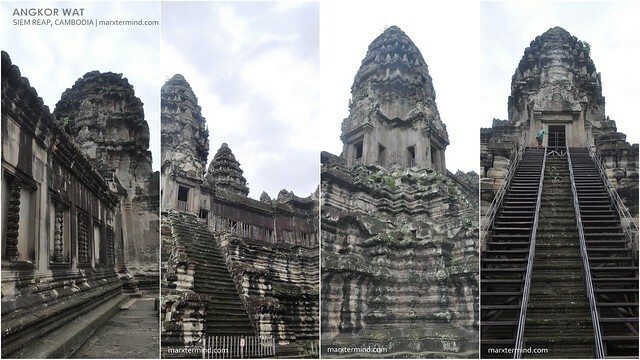 Well, that could be a cooler way to see the Angkor Wat but I supposed that need me to break a bank first. One can also hire a bicycle to visit the entire temple park. This is famous for tourists but since I had foreseen that we’ll all going to be exhausted from all of the temple visitation we will be having that day, I’ve decided to hire tuktuk for the tour. 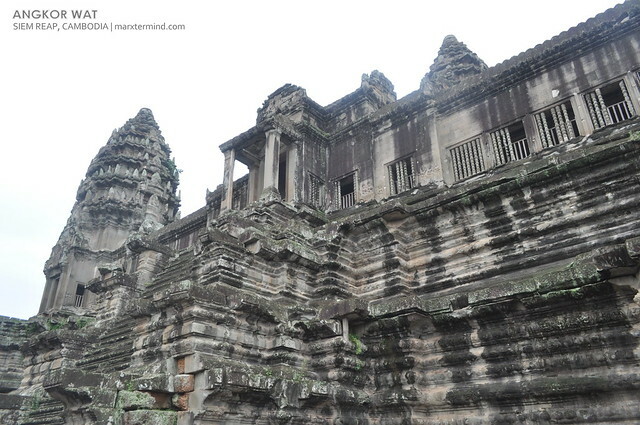 I was in wonder why we had finished too early, and haven’t seen that temple yet made famous by the movie Tomb Raider while we walked back to the parking area. When we had finally found our drivers, we then hopped into our tuktuk. I was suddenly surprised when our driver told us that we will be moving on to the next temple. Well then all my curiosity has been answered. All along I thought we are done with the temple visitation but then I was wrong. 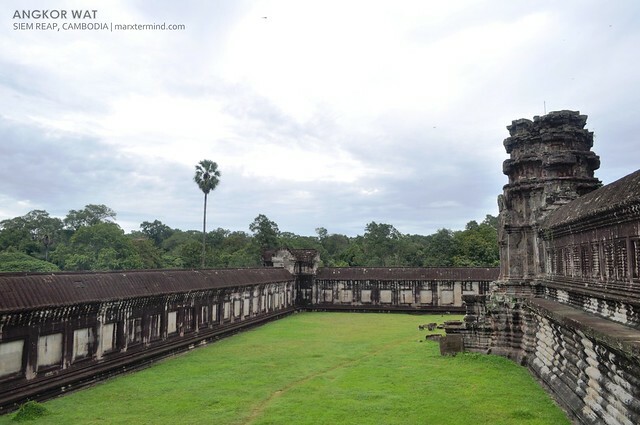 It looks like we haven’t discovered the half of the Angkor Archaeological park yet. Aaaay, dami photos! Love it! I like the one with the dog, parang poporma ng "boss, pwede pasindi?" moment with the two guys eh. fave photo!